Tough Stain Remover removes makeup, grease stains, ink, markers, gum, and more with no problem! Perfect size for traveling too! Don't go to college without some stain remover in your dorm essentials! College is both exciting and a little scary. You're going to be doing things on your own without your parent's help which means you also have to think about a lot of dorm essentials you may not have previously thought of before. College supplies are about more than Twin XL dorm bedding, dorm rugs, and college posters. You also have to think about things like laundry. You're going to need more than a dorm laundry bag and laundry detergent, you're also going to need some powerful stain remover. Even if you're an extremely neat and clean college student, don't go to college without dorm essentials like our Mom's Magical Goop Stain Remover. 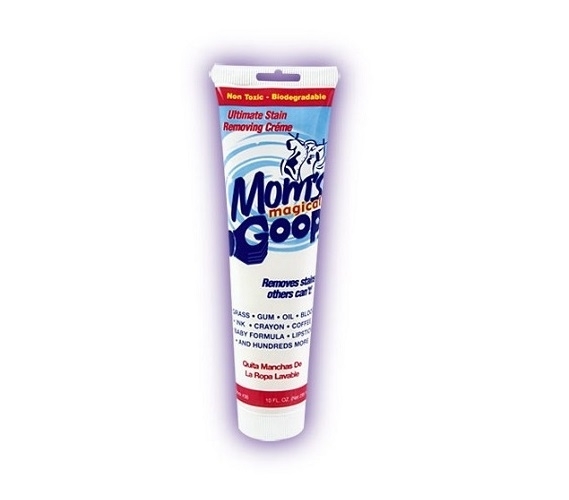 With our Mom's Magical Goop Stain Remover, you will still have Mom there to help you do your laundry. Our Mom's Magical Goop Stain Remover is actually magical. It is a super tough stain remover that even works on old stains. Have a favorite shirt or pair of jeans you can't wear anymore because you spilled something on them and no matter how much you tried to get the stain out by washing, it's still there? Now you can wear that shirt or pair of jeans again! This stain remover works like no other stain remover. It can remove makeup, grease stains, ink, markers, gum, and more with no problem. It can even remove paint! Save your clothes and have some of our Mom's Magical Goop Stain Remover in your dorm necessities!